Aparna from My Diverse Kitchen is not only my fourth guest in the India series but also my first one in the series out of India, living in Goa, in Southern India, on a beautiful coast on the Indian Ocean. One day I hope to visit Aparna and these coconut palm tree strewn legendary beaches. Aparna much like myself has one child, her's a 14 year old daughter, who is the mastermind behind the name of her site. These past 3 years of blogging, Facebook and Twitter have introduced me to many food bloggers and their blogs. Most of these bloggers live in different countries, even continents and come from culturally diverse and different backgrounds from mine. However our love for good food and desire to explore and discover this beyond our comfort zones and cultural boundaries is what keeps us cooking and blogging. Some of these bloggers have become good friends of mine and though we haven’t met (yet) we often have long virtual conversations, mostly centred on food, and many a time beyond that. It’s fun to log into Twitter (and Facebook), even after a short break and take up conversations with friends, from where we had last left off. Shulie Madnick of Food Wanderings is one such friend I met on Twitter. I don’t remember how we first got talking but we did and I found that apart from our love for food we had India in common. Shulie can trace her roots to the Indian Jewish community though she grew up in Israel and now lives in the US. This shows up in her blog where her posts are an interesting mix of the East and the West, accompanied by her beautiful food photography. So when she asked me to do a guest post for her as part of her India series, I jumped up and said “Yes!” Then came the matter as to what to write about. After some discussion with Shulie, I decided to post about Pazham Pori, a dish of batter fried ripe plantains that are somehow very quintessentially Kerala (the southern Indian state that I belong to). Even today, it is usual to find at least a couple of banana plants (along with a couple of coconut trees) behind most houses in Kerala. And just in case you don’t have the fruit in your back yard, there is always the corner store to supply you with some. 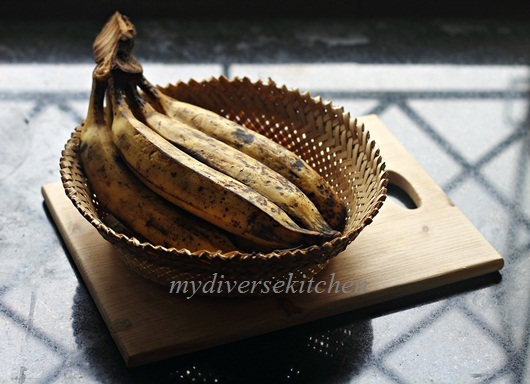 It is not really surprising that in Kerala plantains and bananas feature in many of our dishes. We use the raw fruit, the ripe fruit, the banana flowers, the stem of the banana plant and the leaves make for eco-friendly and disposable plates! Ripe plantain fritters and I go back to my childhood days. In those days, we lived in Africa, where my parents worked. We used to come to India on a 2 month long vacation once every 2 years and this was something we looked forward to. It usually meant we landed at Bombay (Mumbai now)(and, over the course of 2 months, travelled across to the south to Calicut (now Kozhikode) and back while stopping at various places to visit immediate family. I’m talking about the days when a train journey from Mumbai to Calicut took 3 days and 2 nights, there were no air-conditioned coaches and we kids didn’t have i-pods or music players, laptops, electronic games and other paraphernalia to keep us occupied. At the most we had books, but mostly we used our imagination to play games and watch the passing scenery to while our time away. Yet I know that we had more fun on those train journeys than kids these days because, for us, a train journey was an adventure. It was setting forth to distant places, the bonus of not going to school, lots of food that was made specially to last the journey and the anticipation of meeting family at the end of the journey. As children, we would spend the time by making up strange games, singing songs until told to keep quite by our parents, waving at strangers walking along the paths as our train sped by and gazing at the wondrous fare (food and otherwise) being hawked at the stations our train would pull into! When we were kids, eating out or even food that was not cooked at home was considered a no-no. Elders were worried about where food served on the train was cooked, but fresh fruit was considered alright and occasionally we were treated to snacks. A very popular food to eat on the train was boiled or roasted groundnuts (peanuts). It was mostly roasted groundnuts but during the season, if one was travelling in the parts of Northern India we would get freshly harvested and boiled groundnuts which were sweet. The groundnut seller would sell them wrapped up in small newspaper bundles or cones and just about everyone on the train would invariably buy some. Shelling them was half the fun and took a bit of time, which one had plenty of on these train trips, and these groundnuts were referred to as “time-pass” on the train. I still have memories of groundnut sellers with wicker baskets half-full of boiled groundnuts announcing their wares with cries of “time-pass, time-pass”. A train compartment floor littered with groundnut shells was a definitely a sign of much time passed by and the end of a long journey! Another favourite of mine on train trips to Kerala was the “Pazham Pori” which translates to English as “Plantain Fry”. As the name implies, Pazham Pori (also called Ethakka Appam in some parts of Kerala) is batter fried ripe plantain. The best Pazham Pori on the Southern Railway routes could be found at the Shoranur station in those days, but was pretty good at any other station in Kerala. I used to wait for the pantry car attendants to come down with freshly made plantain fritters, crisp on the outside but soft and sweet on the inside. It was quite a nice surprise to discover that my husband shared this love of mine for Pazham Pori, and we have put many of our train journeys back home to good use in this pursuit. As a toddler, our daughter would insist on ordering her share too, only to carefully remove the crisp outer batter covering, eat that and leave the rather soft plantain inside for us! Now much older, she doesn’t quite see plantain fritters the way we do but at least, she does eat them without taking them apart! Mine isn’t an authentic Pazham Pori recipe because it has some twists like the addition of choickpea flour. Traditionally the batter is made with all-purpose flour, some sugar, a bit of salt, baking soda (or baking powder), a pinch of turmeric and water to a coating consistency. Some people also add an egg. Cardamom is not used in traditional recipes, and for a truly authentic flavour these fritters should be fried in coconut oil. However, coconut oil is a bit of an acquired taste so any vegetable oil may be used. Pazham Pori is always made with ripe, but not too ripe, plantains as bananas would be too soft. Sometimes these fritters are made with plantain sliced just once, lengthwise, and can be quite long but I prefer making shorter fritters.. These fritters are deep fried so they would be a bit oily but a good Pazham Pori should never be greasy. Best eaten warm, or else they can get soggy, they should be crisp on the outside and soft on the inside. The batter should be slightly sweet with a faint hint of salt. These fritters are always eaten on their own, an anytime snack, warm and without any sauce accompanied by a cup of tea. I have seen these fritters served with ice-cream, but they’re not quite the same in my opinion. My recipe for Pazham Pori is not authentic and the batter is very much my own concoction but it makes for a very tasty fritter that tastes much like the real thing. Cardamom is not traditionally a part of this dish but can be added to give your Pazham Pori a twist. Peel the plantains and slice each one length-wise into two and each long half into 2 equal pieces (see photograph). Keep aside. Mix all the remaining ingredients, except water and oil, in a bowl and whisk to mix. All as much of the water to the dry ingredients and mix to a batter which is thick enough to coat the plantain slices thickly (somewhat like pancake batter consistency). Pour enough oil into a wok, or fryer to completely submerge the plantain slices when frying. Let the oil heat well but do not allow it to smoke. Using a fork, dip each plantain slice in the batter and gently slide it into the hot oil. Fry 3 or 4 slices at a time. If the slices clump together use a slotted spoon to separate them gently. Fry each slice on both sides till uniformly golden brown and crisp. Remove from oil and drain on paper towels. Repeat with all the slices. Serve warm with tea or coffee, or as an in-between snack, especially on cold days. 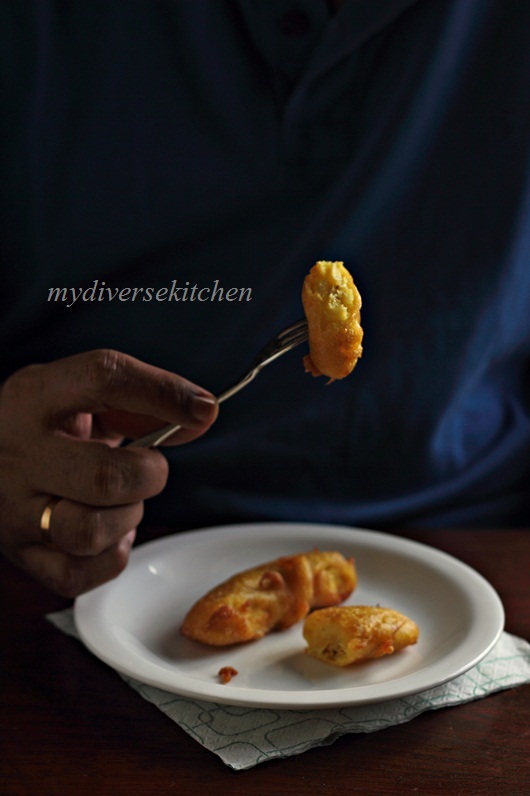 This recipe makes 16 pazham porichathu (plantain fritters). I am big fan of Aparna's photography. Her perspective and food styling always inspires me. And I agree with Kankana, there is so much to learn from her. Love this delectable plantain fritters. It reminds me of my childhood days. I love Aparna's blog and creations. That is one fabulous guest post and the atmospheric pictures are awesome. Fantastic guest post, Aparna is really very talented. Lovely pictures and recipe. Really lovely story! I enjoyed sharing your past memories. Yummy recipe. Had baked plantain once...many years ago when I was living on university campus and my friend of Guadelouoe made this dish for us. Thank you. I'm happy you all enjoyed my post. First of all, gorgeous gorgeous pictures! Now....even better to me are those fritters!!! It's 8am and I wish I could have them for breakfast, with fried eggs on the side! Thank you Shulie for sharing your amazing food blogging friends and thank you Aparna for the great post and recipe! This is my Friday discovery! Shulie, thank you for having Aparna over! 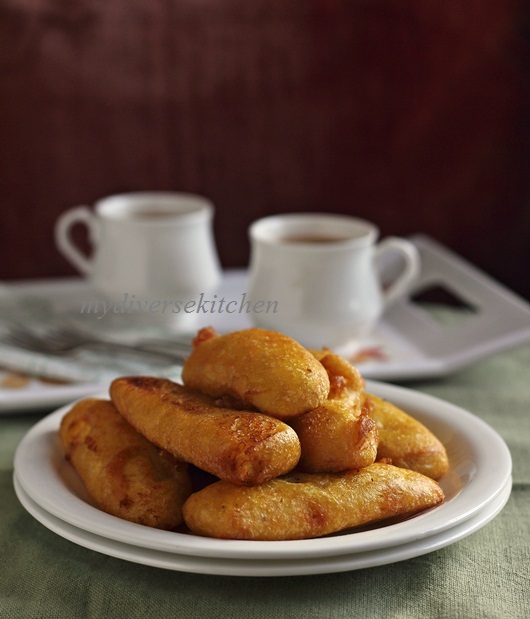 I love plantain/banana fritters and a new version is a welcome twist! I sent a follow request already and looking forward to her tweets! TY so much Aparna for being my guest. I love your cuisine, photography and writing. TY for sharing these fantastic fried plantains recipe as I adore it and never attempted to make it. Now I got no excuse. Thank you everyone for dropping by and say hi. For those of you who already follow Aparna, we all in agreement she rocks. Those of you who don't know her am happy to introduce. Those look great. I had fried plaintains in the Bahama's this summer, and they were delicious. The fritters look even better! :) Beautiful pics and lovely story! Hi Shulie, my first time here! You have a beautiful blog and I am an Ardent Aparna fan. :) I could gorge on these delicacies for a full meal. Beautiful photographs and great writing to boot! These fritters look amazing. I love them and I haven't even tried them. Gorgeous. Really lovely post, Aparna! I love pazham pori, so much so that I once bought nendran, let it ripen and made it, twice in one week! That was the beginning and the end of it, of course! Liked the photo of the bananas in the bowl. I've only had plantain, Latin America style. The aromatic scent of cardamom and the sunset hue of turmeric are alluring in so many dimensions. Thanks Aparna for such a delightful recipe, I've admire your blog ever since I connect with the food community. Ok... those fritters look incredible! Another fabulous guest post! Stunning photos of one of my favorite foods: plantains! This is gorgeous, Aparna. I love this series you put together. I'm like Ken and have only eaten them the Cuban way (of course;)and really want to try this version with cardamom and tumeric. Ooh Alan quite a coincidence. Now you need to try it Aparna's way:). Nice meeting you Harini and welcome. Heather, I am in complete agreement I am yet to make them.Megan I first had plantains with Peruvian chicken.TY Sra nice to see Aparna featured one of your favorites.I know right Ken?! Me too with Peruvian chicken. Also haven't thought of sunset hue, now I will always have images of turmeric and sunsets:). Yuri, you have drawn excellent parallel with tempura and I had no clue about your father and grandfather growing plantains how cool. Nice to know you more and more.Wow and love your recipe. TY Brian. Isn't she, Lora?! An amazing photographer?! I did too when I was in Miami:)Gotta to try the cradamon and turmeric way! :) Thank you everyone for dropping by and leaving a post love for Aparna and these series. You have such lovely memories of travel growing up - one of my favorite things to do now. So great that you recreate that food memory now. What a lovely post in every way. The story, the photos and your guest. Thank you for sharing all of them! Thanks once again, everyone. 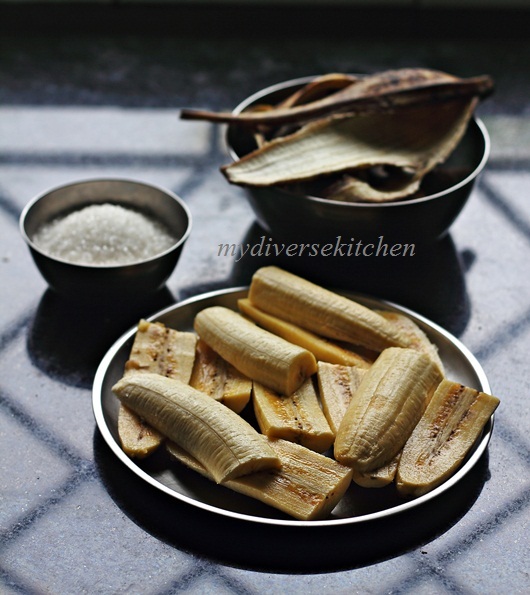 In South India, we have other ways of cooking ripe plantains. We steam cook them, we also cook steam-cooked plantain pieces in melted jaggery so it takes on a caramelised taste.